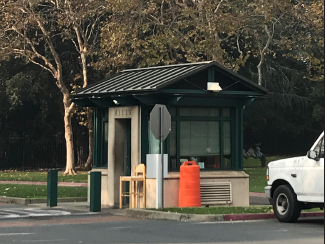 On Friday, Jan. 18, Mills College experienced a three hour lockdown as the Oakland Police Department (OPD) searched for two men suspected of an undisclosed felony. This occurred on the last day of the January term. OPD disclosed to ABC7 News that the crime in question had been committed in Oakland and remains an active investigation. According to Mills Public Safety, the suspects crashed a car in the area of Interstate Highway 580, Seminary Avenue and Calaveras Avenue. From the accident, both men entered Mills climbing over a fence on the Southeast side of the campus. Officers alerted Public Safety to the incident. OPD arrived on campus around 11:30 a.m. to continue their manhunt. The I-580 eastbound off-ramp at Seminary Avenue was also closed during this period. “[OPD] rely on us because we know the layout of the campus, and then once we direct them where they need to go then they take over,” Mills Administrative Sergeant Dennis Bernardo said. In such urgent instances, Public Safety sends registered users notifications and instructions via RAVE and Alertus systems. Email communications can also come from the Mills Vice President of Strategic Development. “Mills College alert: Police Emergency at (location). Remain indoors, seek immediate indoor shelter and deny entry (lockdown) now!” read an email from Mills College Alert System sent to students at 11:38 a.m. The same message had also been texted at 12:10 p.m. This alert was sent to several students who have subscribed to the alerts, including Mills’ student Katherine Zevallos. Bernardo explained that Public Safety is committed to sending updates as soon as possible. Information is being collected as things unfold and time is needed to translate those pieces into an alert. Subsequent updates on the manhunt were sent out at 11:44 a.m. and 12:37 p.m. The first suspect was detained around noon and gave up without incident. The second suspect was located by a police dog in Corporation Yard almost three hours later. “It’s rare that we have an incidence like this where there’s a lockdown. It occasionally happens during the summer so the students aren’t always here,” Bernardo said. Soon after apprehending the second man, OPD gave the “all clear.” Public Safety notified the campus that it was safe to resume normal operations at 2:57 p.m. Then just before 4:00 p.m police said eastbound Highway 850 had opened. Students can register for the Mills Emergency Notification Service, a feature that texts and/or calls with alerts and safety updates, in the Mills Portal under MyMills Resources. This service is optional and preferences can be updated at any time. Public Safety urges students to use their direct information to promptly receive notifications and instructions. Public Safety security officers are on campus 24/7 and can be called at (510) 430-5555. Officers are located at the gate house and patrolling the campus. If students see anything or anyone suspicious, they are encouraged to report it. “Everything worked very well,” Bernardo said. No students, faculty or staff reported encountering the two men before their apprehension.